Love this solar quiz from The Climate Reality Project. Fifteen questions about the history and technology of solar energy. I consider myself to be relatively knowledgeable on this topic, yet missed quite a few of the answers. Question #2, in particular, surprised me. Solar energy is the most abundant energy source on the planet. In many US states and around the world, it’s now cost-competitive with other sources of energy – and it doesn’t emit the dangerous greenhouse gases that cause climate change. Solar is a real win-win in the fight for climate solutions. 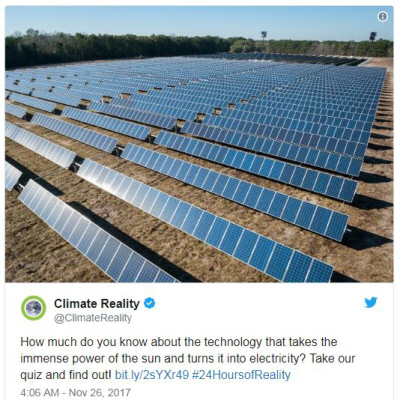 But how much do you really know about the technology that takes the immense power of the sun and turns it into electricity? Take our quiz… and find out! Share your quiz results and comments, and be sure to support The Climate Reality Project!